Summary: In 2154, the wealthy and privileged had abandoned an overpopulated Earth in favor of the Elysium station. Under the protective eye of Secretary Delacourt Rhodes (Jodie Foster), the Elysium population had prospered living free of illness (i.e. cancer, leukemia, etc.) and the scourge of poverty. Max (Matt Damon), a former convict, had worked the line at manufacturing plant for robots. In his youth, Max had obsessed about voyaging to Elysium. Raised by a nun, he had been challenged to remember his roots in LA. Opening the film, Secretary Rhodes had been summoned to address illegals heading toward their secured habitat. Delacourt’s brutal response had placed her in direct conflict with Elysium’s political leaders, including President Patel. Unwavering in her quest for expedient results, the Secretary had assembled a plot to consolidate her power. The struggle between Max and Rhodes had kicked off by his coincidental hijacking of Delacourt’s plan. 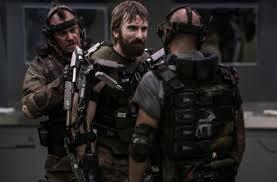 In pursuit of Max had been Rhodes’s military agent, Kruger (Sharlto Copley of Distract 9 fame). A hardened operative on the edge of madness, Kruger had used violence at every opportunity for fear or death. The script’s political commentary on US immigration, while timely, had periodically weighed down the overall pace of the film. The gritty, industrial vision of the future had produced a believable familiarity with military transports, guns, drones and overpopulated slums. Several action sequences had included different rounds of ballistics with jarring, unique effect. The grotesque result of one explosion on a victim had almost been worth the price of admission. Jodie Foster‘s Cheneyesque performance had been a welcome contrast to her idealistic role in Contact. Matt Damon and Shalto Copley had provided range of fun moments from desperation to sarcasm. Director Neill Blomkamp‘s first outing since District 9, while not a classic, had been one of the more visually interesting pieces of sci-fi film this year. This entry was posted in Film, Political, Science fiction and tagged film, Politics, Science Fiction. Bookmark the permalink.